Complete garment: 100% Polyester. Foam: 100% Polyurethane, exclusive of decoration. Robe has self-tie fastening.Belt has buckle fastening. Gandalf robe, belt, hat and satchel. Hand wash, cold water.Do not bleach.Dry flat. Do not iron. 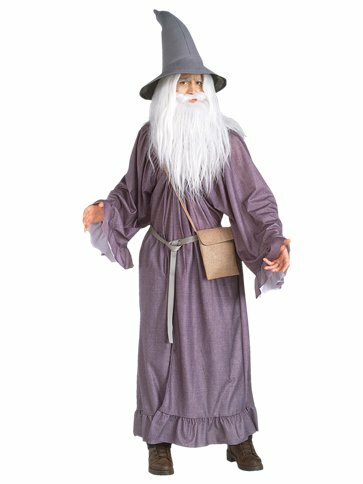 This officially licensed, four piece Gandalf Costume features a long grey robe with self-tie fastening to neckline and a co-ordinating weaved belt with buckle fastening. Also included with this epic movie character outfit is a foam lined, olive green satchel and a foam lined crooked wizard hat. An interesting and unique movie themed fancy dress costume. Why not take a look at our other Lord of the Rings costumes, become the Fellowship of the Ring and battle against the evil forces of the Dark Lord Sauron.